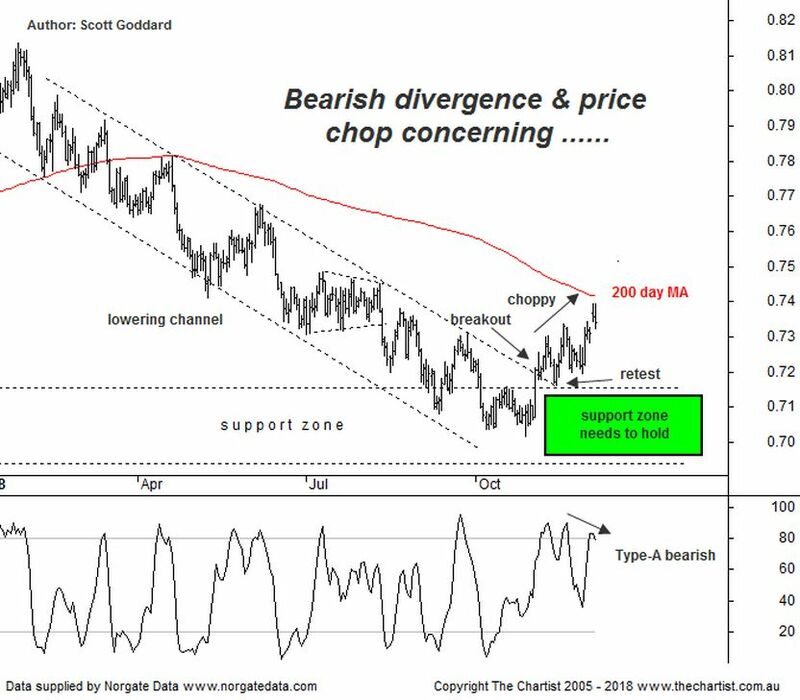 In our last review we were looking for the AUD/USD to pop higher based on it breaking out of the stand out pattern and then successfully retesting the breakout. Yet even though in between reviews buyers came back on board right on cue, numerous headwinds have appeared the closer levels have moved towards 74.00. So here we are now with price action having reverted yet again back to weak. Fundamentally concerns aligns weaker outlooks being forecast in relation to U.S economic growth as well skepticism in regards to the trade truce between China and the U.S which has overall affected risk assets over the past couple of days. Lets take a closer look at the technicals.
? Lowering interest rate cycle appears to have run its course ? The recent technical positives with the AUD/USD have been the breakout from the lowering channel that has been in place throughout all of 2018, the successful retest of the breakout which aligned the upper boundaries of the support zone circa 71.60. Since then though a number of negatives have come into play as mentioned. The first is the choppy price action that followed the retest. It simply reflects a lack of strength. The second is the Type-A bearish divergence that is now in play post price locking in a higher swing low pattern on the 29th November. The third is the overhead 200 day moving average which continues to remain a resisting force (see chart). Last night the gap was filled at 73.26 yet the response to this gap fill was muted and in today’s trading at time of typing price is trading even weaker down towards 73.00. We are certainly not out of the bearish woods just yet. Our long trade at 71.07 with stops now at break even, remains one of a number of trades we presently have going. It was an aggressive play on the currency yet as outlined in our technical section tonight there are a number of weighing factors that the currency now has to deal with more immediately which look likely to create further weakness over the shorter term as a minimum. For now we will simply leave our stop at break even and reassess on a daily basis. Re-published with permission of the publisher. www.thechartist.com.au All copyright remains with the publisher. The above views expressed are not by association FNArena’s (see our disclaimer).